KARI(Korea Aerospace Research Institute) has been releasing KOMPSAT Imagery Quality Report since May, 2016. We have been sharing reports on our website and newsletter every other month. The report of October and November 2018 shows information of KOMPSAT-2, 3, and 3A. It includes location accuracy, ground resolution, etc. The location accuracy of KOMPSAT satellites have improved a lot from the designed specification. Geocento made it their mission to address this issue, by making it as easy as possible for users to access the imagery they need. Geocento uses their expertise in this sector, and in technology development, to save users time and hassle in accessing the data they need, so that they can spend more time on what they do best. To do this, they have developed EarthImages, a suite of web-based applications and APIs which provide users of imagery with the necessary tools to search for, select and access imagery from a multitude of civilian satellites. Alongside this technology, Geocento's expert knowledge ensures that users can be confident that Geocento is providing them with the data which serves their requirements best, in terms of budget or application. Geocento provides access to a multitude of image sources, with their global connections with an unprecedented number of satellite and airborne imagery providers, covering all of your imagery needs. In celebration of the 70th anniversary for adopting the Universal Declaration of Human Rights (UDHR), we are sharing the imagery over the Palais de Chaillot in Paris, France where the UN Human Rights Office decided to enact UDHR. 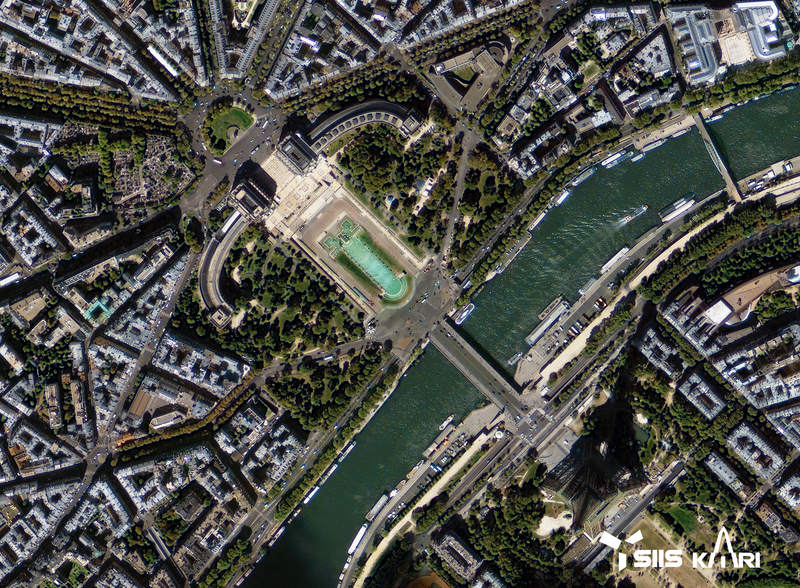 You can see the people walking around the Palais de Chaillot with our VHR KOMPSAT-3A imagery.